Change looms in Havana, Cuba's capital, a city electric with uncertainty yet cloaked in cliché, 90 miles from U.S. shores and off-limits to most Americans. Journalist Julia Cooke, who lived there at intervals over a period of five years, discovered a dynamic scene: baby-faced anarchists with Mohawks gelled with laundry soap, whiskey-drinking children of the elite, Santería trainees, pregnant prostitutes, university graduates planning to leave for the first country that will give them a visa. 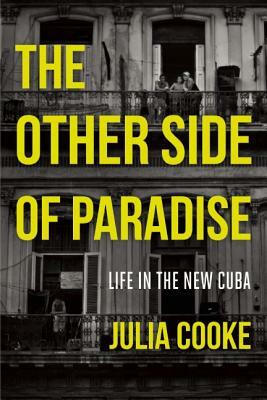 Julia Cooke writes for Virginia Quarterly Review, Conde Nast Traveller, and The Atlantic. Her international reporting has appeared in Monocle, The Wall Street Journal, and Metropolis, and she's written personal essays for the Paris Review Daily, The Christian Science Monitor, and Guernica. Cooke is the recipient of fellowships from The Norman Mailer Center and Columbia University. She currently lives in New York City, where she teaches writing at The New School. never gets in the way of her search for the elusive truth." today, without tourist plans or political agenda." lives spent waiting for change." transition, with all their contradictions, sorrows, and calluses. The Other Side of Paradise is a tear-through read, full of vitality and compassion."